It's a pint sized power plant. Location aware. Voice recognising. App-mashing and multitasking. It can connect at breakneck speed. Power and intelligence can be more than a phone... 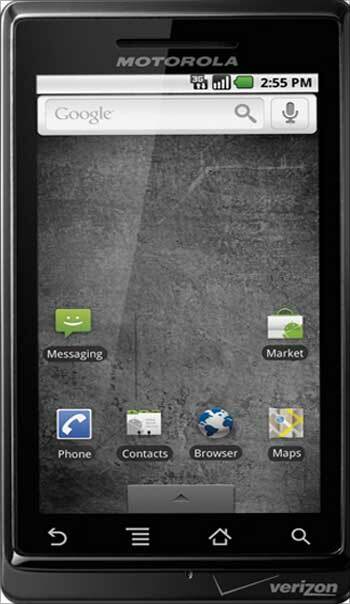 It's Droid from Motorola, the world's first Android 2.0 phone. Er...what is Android? Well, to put it simply, Android is a flexible software platform, or mobile operating system, designed to deliver a personalised and customisable user experience on mobile devices. It was first designed by Google. Android will serve as the operating system on many of Motorola's future handsets. Media reports quoted Verizon's chief marketing officer John Stratton as saying that the price of the Droid is set at $199, with a two-year contract and a mail-in rebate. However, no information is available on its launch date or price in India. Read on to find out more about this amazing gadget. . . The web is richer. Photos are sharper. Videos pop. It has the most advanced Google browser and Android 2.0 software with a blazing-fast processor and 3G speed for faster search. 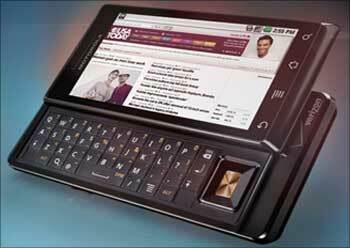 It has the world's thinnest QWERTY slider at 13.7mm. It can help you navigate turn-by-turn. It has a 5MP camera with a flash, plus loads of great camera features and a DVD-quality recorder to capture all the richer, bigger, wider experiences you're going to have. Search and find: Tell Droid what you're looking for using voice-activated search and it will serve up both your contacts and Google Web search results based on your location. Want more? Simply type into the search bar and Droid will search your apps, contacts, browser, music and even YouTube. Pocket camera: Take stills and videos with the 5MP camera with flash, zoom and auto-focus and DVD-quality video recorder. Mails: Both Gmail and Exchange emails (Microsoft's Exchange server that resembles Outlook) are pushed directly to your inbox. It's clutter free: Droid's status bar acts as your personal dashboard, so that new messages, emails, sync alerts and more show up as organised icons. Pull down the expandable notification panel to see what you want to see, when you want to see it. Go anywhere, everywhere: With Google Maps Navigation Beta, DROID gives you spoken turn-by-turn directions, and your route overlaid on Google Maps Street View. No wonder Moto proudly claims, it's the phone with the "Hi" IQ. 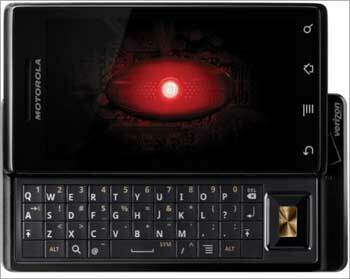 At 0.54 inch thick, the Droid is slightly bigger than the 0.48-inch iPhone 3GS, but it still has room for a 40-key, slide-out QWERTY keypad. At just under 6 ounces, it's about an ounce heavier than the iPhone 3GS. When closed, the 4.56-by-2.36-inch Droid is almost the same size as the 4.5-by-2.4-inch iPhone 3GS. 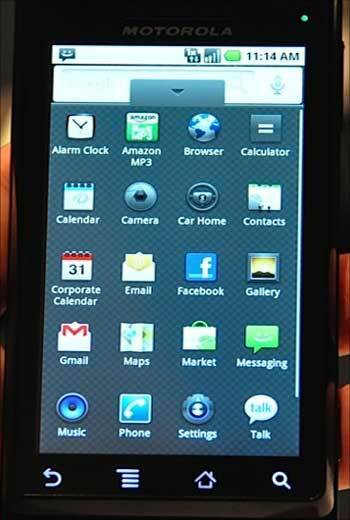 Droid's 480-by-854-pixel display offers 409,920 pixels, more than double the 153,600 pixels that the 480-by-320-pixel, 3.5-inch screen on the iPhone 3GS offers. The Droid's resolution also compares well against that of Android 1.6-based phones such as T-Mobile's myTouch 3G, which has a 3.2-inch, 480-by-320-pixel display. Unfortunately, the keyboard is so shallow--and the keys themselves are so flat--that it will take a while to get used to it. The Droid is also missing physical Talk and End keys, which are pretty much standard on every other cell phone.